The analyses of changes in snow depth, snow amount and melted snow amount was completed during October-April, in Romania, under the RCP 4.5 and RCP 8.5 scenarios for the timeframes 2021-2050 and 2070-2099. The reference interval considered is 1971-2000. In the analyses the results of numerical experiments were used, with five regional climate models from the EURO-CORDEX program. 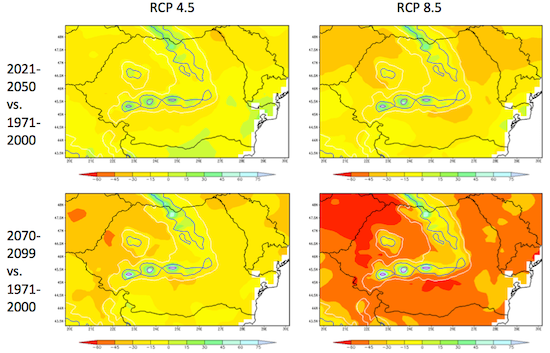 Under more intense radiative forcing (RCP 8.5 scenario) the decrease of the snow depth, the amount of snow, and the increase of the amount of melted snow in mountainous areas are higher in the analysed intervals. These changes will become stronger at the end of the XXI century, especially under the RCP 8.5 scenario. 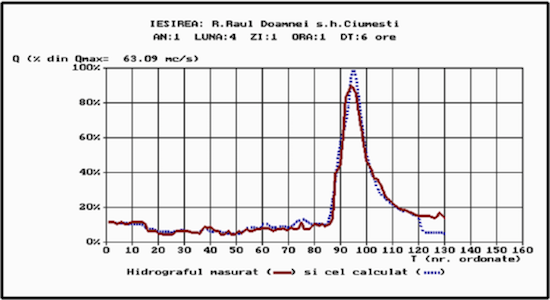 A hydrological model calibration was performed by simulating the snow accumulation and melting processes in the upper part of the Arges and Ialomita river basins. To simulate the flow in the upper part of the Argeş and Ialomiţa river basins the conceptual hydrological model Consul was used, model developed within the I.N.H.G.A. The main rainfall-runoff processes considered by the hydrological model are: accumulation and melting of the snow cover, precipitation interception, water storing in depressions, evapotranspiration, infiltration, percolation, surface runoff, hypodermic runoff and basic runoff. The previous analyses have continued in order to develop the empirical model that links the atmospheric circulation characteristics to avalanches indices. Thus, a list with the dates of avalanches was drawn up, starting from 1928 to the present. Related information are also available for these events which have taken place in the Ceahlău, Făgăraş, Bucegi, Lotru, Rodna, Retezat, Piatra Craiului, Căpăţânii, Gutîi, Postăvaru, Ţarcu, Vâlcan, and Baiului mountains. The most frequent avalanches are recorded in the Făgăraş and Bucegi mountains.